Use our SLS Las Vegas promo code for a 35% discount and free continental breakfast during your stay. Just click on your friend Coupon Puppet below and enter Las Vegas on the Starwood site to take advantage of this great deal at one of the newest hotels in Las Vegas! Please note, you must be a member of the Starwood Rewards Program to use this deal. But signing up to be a Starwood Preferred Guest SPG member is fast and free, so it’s totally worth it! The SLS Las Vegas is gorgeous. It is nice and new(ish) and not nearly as crowded as other upscale Las Vegas resorts. It’s got amazing food options like Katsuya, Umami burger, 800 Degrees Pizza, Bazaar Meat by Jose Andres and Cleo by Danny Elmaleh. The SLS pool has a bar in the middle of it! The Foxtail nightclub is hip. The room prices are totally reasonable. So why doesn’t everybody want to stay at SLS Las Vegas? We have an inkling that the hesitation to stay at the SLS is about the location. It is on the North end of The Strip. It’s so far North, we hesitate to call it a Strip hotel. But it is technically on Las Vegas Blvd, so we’ll allow it. There is almost nothing within walking distance, BUT the SLS Las Vegas is one of the few hotels that is very, very close to the Las Vegas Monorail. At other hotels you wind your way through the labyrinth of the casino to the deserted back of the hotel in order to find the monorail. At the SLS, you exit your guest elevator and you are there in two or three minutes! That means you can be in the heart of The Strip in mere minutes. And the Las Vegas Convention Center is only two monorail stops away, making the SLS a no brainer for those attending conventions. It’s much nicer and often the same price as the convention mainstay Westgate, which is one monorail stop away. We feel it is our duty to inform you about something that makes the SLS exceptional in terms of Las Vegas hotels. When you are booking your reservation, keep an eye out for the words “Mini Bar Included In Rate.” You read that right. The SLS has two towers (their third was recently taken over by The W Las Vegas). The World Tower has lovely, modern rooms. The Story Tower has lovely, slightly smaller modern rooms and THE MINI BAR IS INCLUDED. All the juice. All the booze. Everything! Now, they are not going to replenish it every day. That would be crazy. But for the duration of your stay, you will get to partake of all the contents of your mini bar FOR FREE. Truly exciting news for those of us who are too frugal to have ever partaken of a $6 Snickers. We are scared this minibar offer may end at any time, so be sure to look for “Mini Bar Included In Rate” when you are booking your reservation for the Story Tower. The SLS is already very inexpensive when measured against comparable resorts further South on The Strip. Then you save even more money with a free minibar and our SLS Las Vegas promo code for 35% off and free breakfast! It’s win, win, win! 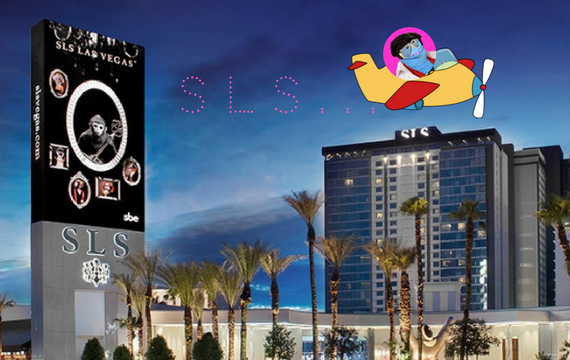 Coupon Puppet Loves Saving You Money With An SLS Las Vegas Promo Code!